We are able to handle almost all interior concrete demolition projects from pump bases, stairway openings, from tile removal and bank vaults. We can offer a total package to cut, remove and replace if required. With our electric remote control Brokk Breaker and Crusher we can minimize noise and dust for those sensitive projects in hospitals and swimming pools. For our specialty demolition services, we have the Brokk line of electrical remote breakers. With the Brokk robot, we can meet today's strict requirements for efficiency and safety. Some of the unique properties of the Brokk are that it is remote controlled, providing unsurpassed operator safety. The Brokk is also powered by electricity making it the equipment of choice when working in poorly ventilated conditions or areas where gas operated machinery is prohibited. The extremely small size and low weight make it perfect for any job and the many tools give the Brokk an extremely high level of utilization. With the Brokk's 20 feet of reach and 360 degree radius, it is an excellent choice in demolition for de-bricking cement kilns, interior demolition, concrete staircases, plaster , brick and many other applications. Some of the many attachments available to the Brokk are the 18" crushing jaws for delicate demolition requirements and a scabbler attachment used for profiling and grinding hard surfaces up to 1.5" in depth in a single pass which is excellent for profiling cement for adhesive purposes. 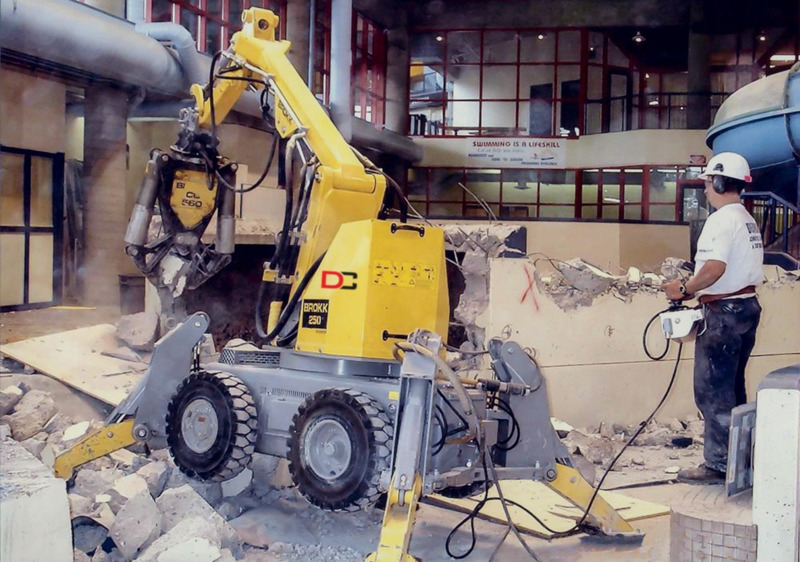 The model Brokk 90, weighing only 2100lbs, can fit through a normal doorway for all your interior demolition.